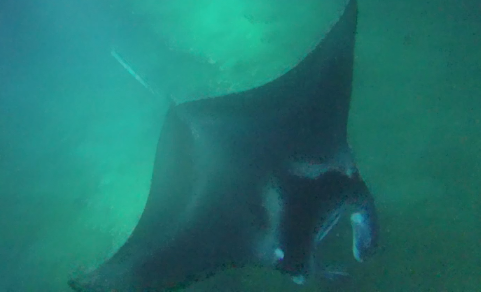 Individual manta rays are identified by the black markings on their undersides. Night-time snorkelling with manta rays off the Big Island coast was one of those experiences that will stay with us forever. This tourist activity developed when divers noticed that their lights attracted zooplankton, which, in turn, attracted manta rays. Boating companies discovered that if they coordinated their efforts, their lights could attract more rays. Now, several boats moor off the Kona coast each night, attracting several rays every time. The practicalities go like this. Paddleboards have been fitted with lights shining down into the water. A tube structure is attached to the paddleboards for snorkellers to hold on to, so as not to drift off in the dark. All we had to do was float horizontally in the water, clinging on to the paddleboard structure. Piece of cake. There was no actual snorkelling involved at all. 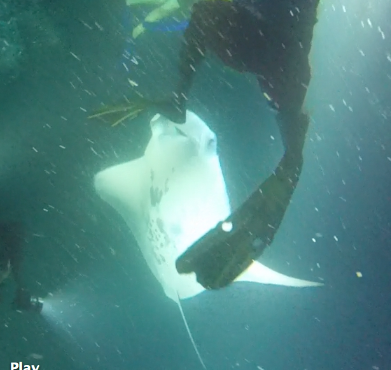 The rays are huge, and were very close to us, but they never touched us. They seemed to know exactly where their bodies finished. The rays can measure 23 ft from wingtip to wingtip in the open ocean, but coastal rays tend to span a mere 16 ft. They’re related to stingrays, but don’t have tail barbs or stingers. They’re also related to sharks, but don’t have sharp teeth. They don’t need them because they eat plankton by swimming with their mouths open. The horn-shaped fins on their heads (the very fins that earnt them the name “devil rays”) help funnel the plankton into their mouths. There are gazillions of visible plankton in the columns of light under the paddleboard. Manta rays come close to the lights, flying serenely under the water and somersaulting around to soar through the feast again. They’re elegant and enormous, and seem to be dancing. Gabriella reckoned the manta rays looked as if they were having an underwater disco, but if that’s the case, it was a slow motion one. 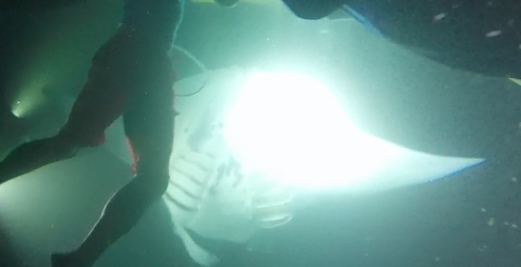 I thought that the rays were too graceful to be disco dancing; they were more acrobatic, or balletic. Whatever the analogy, being so close to them was a treat, and one we’d repeat in a heartbeat. Here’s a compilation of video clips that Gabriella and Max took.